Austal USA reports that the first 107-meter vehicle-passenger catamaran built at its Mobile, Alabama, facility has been handed over to the Hawaii Superferry Corporation and will now transit to the Hawaiian Islands to commence service later this summer. 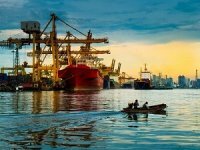 The ferry, which received the name "Alakai" in a traditional Hawaiian ceremony, successfully completed sea trials in the Gulf of Mexico in April. 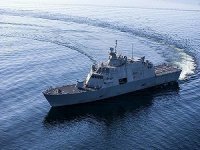 "Sea trials went very well and we are extremely pleased with the capabilities of this vessel," said Austal's Chief Operating Officer, Dan Spiegel. "It's truly remarkable to experience the power and control of this catamaran. 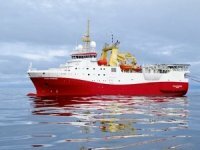 Completing sea trials in only five days and achieving or surpassing all performance parameters specified for the vessel is an excellent result." At 90% MCR (maximum engine power) the ferry achieved 40 knots (two knots above contractual requirements) with operating deadweight onboard and an installed active Ride Control System. The ferry consistently averaged 42.5 knots at 100% MCR during the course of trials. Though sea trials went well, the Coast Guard's detailed inspection and certification for this first-of-its-kind U.S.-built vessel appear to have taken a little longer than anticipated. 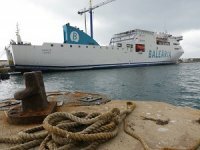 On May 24, Hawaii Superferry president and CEO John Garibaldi announced that the Alakai's entry into service, originally planned for July, would be pushed back by at least one month, quoting the time needed for the "extensive inspection process." "We extend our deepest appreciation to Austal for their commitment to meeting the highest performance, safety and construction standards for which the company is known," said Garibaldi. "The Alakai is an outstanding vessel and we are looking forward to welcoming the Alakai and her crew when she arrives home and to launching service this summer." 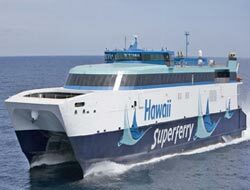 With a second identical vessel under construction, Hawaii Superferry plans to use Austal fast ferry technology to establish Hawaii's first high-speed vehicle-passenger service. 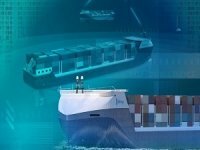 With a draft of 11 ft 8 in and a beam of 78 ft each 349 ft 4 in catamaran can carry 866 passengers and up to 282 cars (or a combination of 28 40-ft trucks and 65 cars). With speeds up to 40 knots, Alakai will provide services connecting Honolulu to Maui and Kauai in three hours and from Honolulu to the Big Island in approximately four hours. The second ferry will begin service in early 2009. 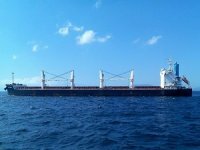 With the entry into service of the second vessel, the company will offer two round trips per day between Maui and Oahu and one round trip per day between Kauai and Oahu and the Island of Hawaii and Oahu will be offered.